Media captionExperts say the artist's work showed "startling modernism"
The rebellious Victorian artist behind some of the world's most admired stained glass was forgotten after she gave up motorbikes and cigars to become a nun, an exhibition has revealed. Heavenly Lights at Shrewsbury Museum & Art Gallery tells the untold story of Margaret Rope. Born in Shrewsbury in 1882, experts say her work shows "startling modernism". 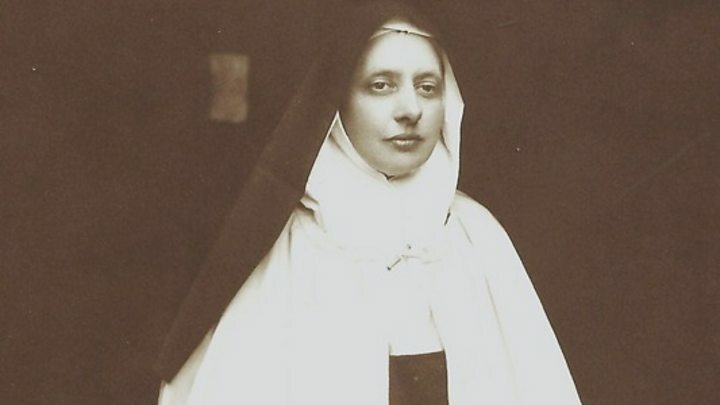 But she joined a convent, requesting her work be destroyed after her death, and her "genius" went uncelebrated. Rope died aged 71 in relative obscurity. Rope's colourful windows survive today in churches across the UK, Australia, South Africa and Rome - and in museums in Los Angeles and New York. Marga, as she was known to her friends, wore her hair short, smoked cheroot cigars and forged a career at a time when women were largely suppressed, Dr Sally Hoban, a historian at Birmingham University, said. "There's a story about her and her sister riding across England on their motorbikes at the beginning of the First World War," her cousin Arthur Rope said. "When they got to Suffolk they got arrested for being German spies because people couldn't imagine what two women were doing on motorbikes." Aged 18, Rope enrolled at the Birmingham School of Arts where she learned to design and make stained glass. Less than 10 years later, when she began to gain recognition for her art, Rope became a devout Catholic and chose the harsh life of poverty and prayer as a Carmelite nun, Mr Rope said. Rope joined the Carmelite Monastery in Quidenham, Norfolk, where, shut off from the world, she continued to create stained glass in a small studio. Stuart West, Shropshire Council's cabinet member for culture and leisure, said he hoped the exhibition, which runs until 15 January, would attract the recognition the artist never experienced. "Margaret Rope was one of the greatest stained glass artists of the early 20th Century, and her works can be seen all over the world," he said. "Despite her obvious genius, her name is hardly remembered at all, and we hope this exhibition - the first dedicated solely to her work and times - will give her reputation the boost it deserves." See more on the life and work of Margaret Rope on BBC Inside Out West Midlands on iPlayer.